Hi Sarah, I am a male with extensive stretch marks on my stomach, hips, and the sides of my chest. From reading the posts so far I understand that I would use a 1.5 roller on my stomach, but am not quite sure what needle size to use for my chest and hips. 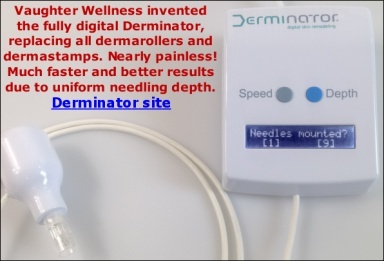 Also if I were to use a derma stamp in conjunction with the roller, which needle lengths would I use on these parts of the body? Moderate vit. C supplementation is not required when on a healthy diet, but it doesn't hurt. 1) Do I both wash my skin and apply the alcohol before and after rolling and stamping (except i can use soap in the before part)? 2) So I don't need to use A-ret or infadolan? Wash your stretch marks with water and soap and disinfect it with alcohol prior to microneedling. Post-microneedling, have a shower without using soap or anything else. Let it dry and apply the creams. Yes, you do use the A-Ret cream (= Tretinoin cream). A-Ret is just a name of a cream containing the substance called Tretinoin (also called Retinoic Acid), which is acidic form of vitamin A. Use as explained in the link I gave you. Tretinoin is useful for stretch marks but it does not protect or moisturize the skin after dermarolling/stamping. For that, we provide an ointment called Infadolan. You should apply Tretinoin to your stretch marks and on top of that, apply a little Infadolan.